Frying oil, about 4 cups depending on the size of the pot. The croquettes should be entirely submerged when frying. Place the potatoes in a medium pot over medium heat with water. Cook for 15 minutes or until the potatoes are soft. Remove the potatoes from water and mash with the help of a masher or fork until there are no big pieces left. Set aside. Place the cod, quinoa, onion, green onion, parsley, nutmeg, salt and pepper in a medium bowl and mix them. Add the mashed potatoes and mix well until everything is combined evenly. 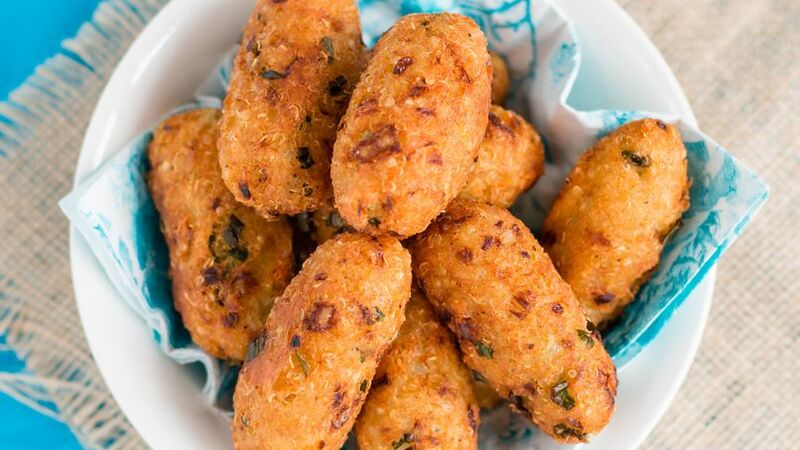 Form the croquettes in a cylindrical shape with your hands, about 2 1/2 inches long. Place the oil in a deep pot over medium-high heat. Heat the oil until it reaches a temperature of 370°F. Fry the croquettes 4 at a time until they're golden brown on all sides. Remove from the oil carefully and place them over paper towels to absorb any excess oil. To cook the cod, all you have to do is boil it in water for approximately 15 minutes. Because it's salted cod, you won't need to add anymore salt. When you crumble the cod, you should do it carefully so you get rid of all the bones. Cod is one of the most popular ingredients during Lent. There are many ways to prepare it and they are all delicious. Today I share with you my recipe for quinoa and cod croquettes, one that I adapted carefully because my daughter is allergic to eggs. Enjoy!